Multiple fires are currently burning in California — the Camp Fire north of Sacramento destroyed the town of Paradise, burning more than 7,600 structures, most of them homes. The Camp Fire has burned over 125,000 acres and is approximately 30 percent contained, according to CAL FIRE. The Woolsey fire has swept through parts of Los Angeles and Malibu, destroying over 435 structures with as many as 57,000 believed to be under threat. This fire is 35 percent contained and has burned nearly 96,000 acres. The Hill Fire in Ventura County has been kept to about 4,500 acres and is 90 percent contained. Across the state, 44 people have been killed in these fires, and more than 200 people are missing in the area of the Camp Fire. 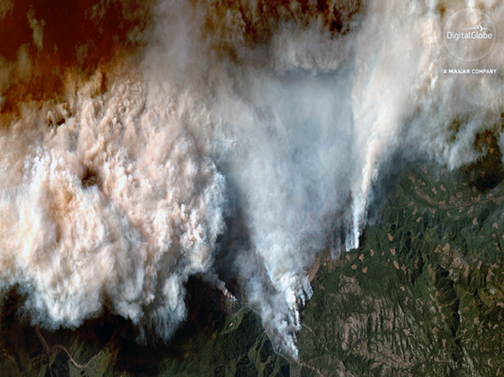 These fires are fueled by fierce winds, blowing as hard as 86 miles per hour. Camp Fire, near Chico, California, WorldView-3, November 9, 2018. Photo is courtesy of DigitalGlobe, a Maxar Company. When crises like these occur, DigitalGlobe is committed to supporting the humanitarian community and fulfilling Maxar’s purpose of Building a Better World by providing critical and actionable information to assist response efforts. As part of the company's Open Data Program, DigitalGlobe will publicly release data of the affected areas to support disaster response as it becomes available.